Found a great deal on a car on-line? Watch out for fraud! When Reategui contacted the person, the deal seemed to get even better. 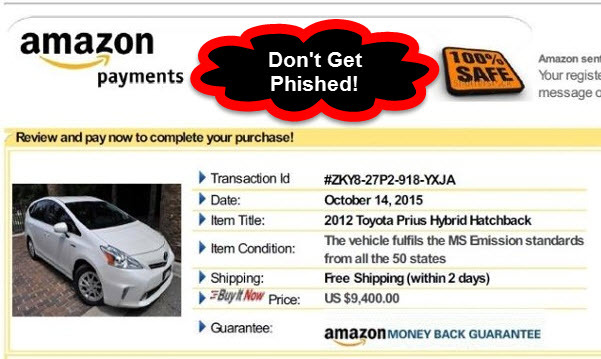 The seller claimed she was being deployed to Afghanistan and that she was selling the 2012 Toyota Prius Hatchback via Amazon.com's so-called Vehicle Purchase Protection Program. The deal included free shipping and a 100 percent money back guarantee. "I said, 'Wow! Amazon is selling cars now?' It gives you a little security," Reategui said. AMAZON: "We don't sell cars:" The seller instructed him to call Amazon at the number on the invoice to make a payment. The problem – Amazon doesn't sell cars. "We don't sell cars on Amazon.com," Amazon spokesman Tom Cook said. "We have heard of this before, it has happened in other areas so we tell customers to be careful. Trust is a big factor for us. Make sure if you think you are buying from Amazon that you are on Amazon.com." Cook also confirmed that the number the seller provided Reategui was not their customer service number. When Local 10 News investigative consumer reporter Christina Vazquez called the number, the woman who answered said she worked with eBay Motors. The woman also said she could help with an Amazon-related car purchase. After Vazquez identified herself, the woman promptly hung up. A few days later, the number was disconnected. eBay Motors is a real online platform, but a company spokesman said the number provided is not one of their customer service numbers. The FBI issued a warning about scammers using false protection claims to lure online car shoppers. Tactics include con artists saying they are offering a sales price below book value because they are moving for work, to include military deployments. "In fraudulent vehicle sales, criminals attempt to sell vehicles they do not own," the FBI said. "The criminal pockets the payment but does not deliver the vehicle." From: Amazon <vpp @ supportprotection.com> Which was registered through Google as a GoDaddy re-seller. A common occurrence these days. It reads Amazon but from @supportprotection.com which is fraudulent domain registered with privacy protection to cloak the scammers true identity. Domains like these are usually registered with someones stolen identity or credit card. RED FLAGS: Another red flag is that the seller wanted Reategui to wire the money. Be sure to also read Doc's popular article "IUsed Car Buying And Selling Internet Tips By A Retired Auto Dealer" The most informative article ever published about online car buying and selling.